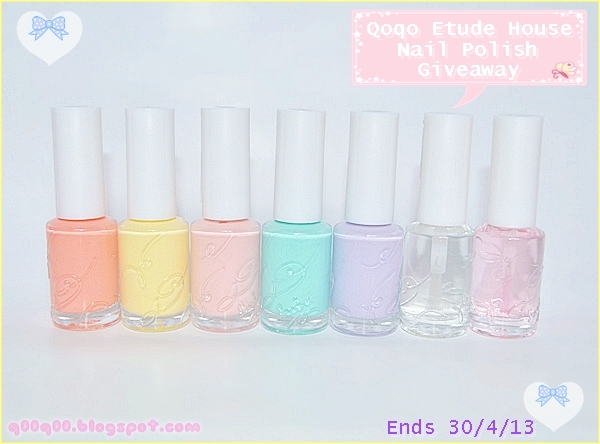 This is my 1st Giveaway for year 2013, there are 5 different colors of Etude House Look at My Cotton Candy Nails, also Look at My Nails Care 1 Smoothing Base Coat and Longshine Top Coat. How do I draw the Winner? When does the Giveaway ends? 30th April 2013, Winner will be announced on the next following 1 or 2 days. How do I receive if I won? Is the Giveaway open to everyone? Yes, it's for International, the prize will be posted by International Registered Mail. *Note: if the winner don't reply within a month after announced, there will be a re-draw for another winner. 1. Follower Nickname: Natalia L.
I love the prize, and your blog is so cute! 2. Side Bar Giveaway: I don't have a blog, sorry..
Hey there!! Thnk u for the giveaway!! Joined!! I love the colors of those nail polishes. Awesome giveaway! Awwwww I love your blog!! I follow U! I will participate ><! Thanks!